The West Virginia workforce continues to grow in the health sciences, law enforcement, business, construction and information technology industries. The state’s vocational and trade programs provide training and certificates to high school and post-secondary students, achieving a performance level exceeding the national average. While many positions through 2016 were created to replace existing workers, almost 80 percent of these jobs required only on-the-job training. The following guide outlines vocational and trade school options in West Virginia along with employment opportunities for graduates. 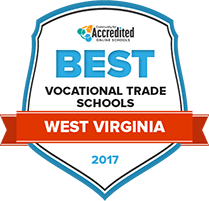 West Virginia's citizens can choose from any number of the following ranked trade and vocational schools. Through these institutions, in addition to the career and community colleges available, students can enroll in programs that are in any of the big three fast growing industries in West Virginia: healthcare, information technology and manufacturing. Our rankings take into account tuition, financial aid options, student-teacher ratios, program quality and other factors that matter most to students looking for top-notch accredited schools in West Virginia. For over 40 years, Mountwest Community and Technical College has offered training and education in high-demand career fields. Students can choose from associate and certificate programs such as communication, allied health, applied technology, business technology, hospitality, information technology, legal studies, and management. MCTC prides itself on state-of-the-art technology and free Wi-Fi available in classrooms and on-campus. The school offers over 100 online courses each semester, as well as a core coursework transfer agreement which helps students meet general education requirements necessary to count towards a degree from a four-year university. Students attending West Virginia Northern Community College can receive education in trades and fields like healthcare, teaching, criminal justice, culinary arts, business, applied technology, and computer information technology. WVNCC aims to produce highly skilled, well-rounded, and accomplished workforce members. The school works to make education flexible and accessible to students by providing online learning opportunities and three campus locations. Several associate degrees and certifications, including an AAS in Business Administration, can be earned entirely online. WVNCC is accredited by the Higher Learning Commission, and has formal agreements with nine four-year universities that facilitate smooth transfers as junior status students. A trade certificate or associate degree from New River Community and Technical College can help students enter the workforce with necessary skills and training, or to move on to a four-year university. With degree programs like business administration, criminal justice, elementary education, medical assisting, paralegal studies, and automobile service technology, there are plenty of opportunities to gain professional knowledge and training. New River’s Career Services work to help prepare and place qualified students in jobs and internships that will utilize learned principles and provide additional experience and learning milestones. John D Rockefeller IV Career Center in West Virginia is known for its state-of-the-art computer and technical area labs. The modern tools and professional staff help prepare students for real-world workplace situations. Course offerings include auto collision repair technology, automotive technology, carpentry, electronics systems technician, diesel equipment technology, career exploration, therapeutic services, and welding. They also offer a Practical Nursing (PN) program and a Commercial Driver’s License program for truck drivers. Daytime and evening classes are available so students can have flexibility as they juggle their educations with work and personal life. The U.S. Department of Labor predicts the greatest number of West Virginia job openings will be for nursing assistants. 25 of West Virginia's high school vocational and trade programs offer five or more occupational areas of study. 16 colleges in West Virginia offer vocational and trade school programs. Vocational jobs in the state earn competitive salaries: the West Virginia Department of Commerce reports that occupations requiring a two-year degree or less pay more than 90 percent of the salaries awarded to holders of four-year degrees in the state. The Community and Technical College System of West Virginia is comprised of nine colleges situated on 27 campuses. While many of West Virginia's vocational and trade school programs are career-specific, graduates may also complete an associate or bachelor's degree in the same area of study. Community and junior colleges, public career centers and private schools offer post-secondary education with a specialized focus on career preparation in business, healthcare, technology and human services. Refer to the following chart for the breakdown of certificates, associate degrees and bachelor’s degrees earned in West Virginia and the nation as a whole. The West Virginia economy is largely based around the healthcare, coal and chemical industries. Eight of the top 20 West Virginia employers are in healthcare, including Charleston Area Medical Center, West Virginia United Health System, Cabell Huntington Hospital, St. Mary’s Medical Center, Wheeling Hospital and Mylan Pharmaceuticals. Other top employers are Wal-Mart, Murray American and Energy Kroger stores. These top employers spell opportunity for vocational graduates of programs in the health sciences, transportation and manufacturing. West Virginia’s healthcare industry offers the largest number of job openings. The chart below illustrates the occupations offering the most opportunities for vocational and trade school graduates in the state. Charleston, the state’s largest city, is home to eight junior colleges, career centers and trade schools with programs leading to vocational and technical certificates and associate degrees. Some 11,000 Charleston residents work in health-related occupations, and this high number of health-related jobs have made vocational and trade school programs in nurse assisting, home health care, nursing and care aides high-demand programs. The Garnet Career Center offers vocational programs in automotive technology, business education and licensed practical nursing. Online programs are offered at the Garnet Career Center in accounting, business, design, healthcare and technology. The Carver Career Center offers diploma and associate degree programs in automotive repair, culinary arts, barbering, dental assisting, HVAC technology, welding and computer applications. Students planning to transfer to four-year degree programs can complete their degree in Charleston at Marshall University, West Virginia University, West Virginia Tech and West Virginia State University. The Community and Technical College System of West Virginia participates in the statewide initiative to assist students with average grades to transition to post-secondary education and career training. West Virginia ACTE is the state chapter of the national association that advocates for the development of a well-trained and competitive workplace. Its secondary education and community college/trade school programs prepare students for future careers in vocational trades. The DOL oversees labor and safety laws affecting West Virginians. It operates the contractor licensing program, weights and measures division and WV wage and hour statistics. Find 2015-2016 information on secondary programs of study, adult programs of study, and Career-Integrated Experiential Learning (CIEL) certificate programs in West Virginia. Learn about the state’s PROMISE Scholarship, AmeriCorps and financial aid programs available for West Virginia post-secondary students. Resource for West Virginia residents to find jobs, get unemployment assistance, learn about training and education opportunities and get information on the local job market.